For some reason, I always forget how much I enjoy middle-grade as a genre. They’re childish and fun, yet tackle difficult topics that come with becoming an adult. Yet, I just never automatically go to them and read them. I don’t know why! But, I read and so enjoyed this one. It was fantastic. Now, I never got into Riordan’s various series. I’ve tried multiple times and they’re not for me. But I am all for his publishing company! I love that he’s giving a platform for marginalized communities to write about their mythology and religions from an ownvoices standpoint. It’s absolutely glorious. 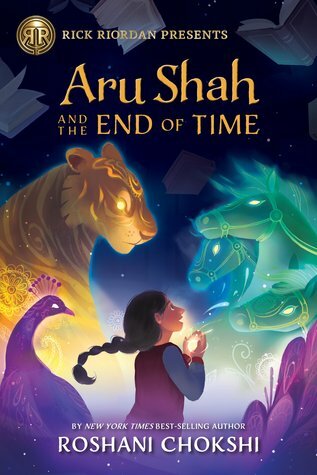 Aru Shah is an Indian-American twelve-year-old. Her mom works in a museum and they live above it. She goes to a school full of people that she doesn’t fit in with for various reasons. Religions, skin color, parent’s income. Oh, and Aru likes to embellish the truth. A lot. Then, one day, she does something to show off and ends up starting the Mahabharata story all over again with the Pandava brothers coming back. Except, this time, they’re sisters. I loved how this book tackled so many things, especially the sexism that is in the Hindu religion. I know that it’s changed over the years, but it’s still rather traditional. A woman’s duty, or dharma, is to get married, have kids, and follow her husband. She’s not supposed to be a heroine and save the world. This book really just looked at who can and can’t be a hero. And, why can’t a couple twelve-year-old girls be heroes? I’m all for it. And the characters were so much fun. I loved the fun play on gods and goddesses, along with the main girls that led the story. Aru was so complex, as all women should be. She loves her mom, yet is conflicted about it. She lies to fit in, but that alienates her. Oh, and she is wearing Spiderman pajamas most of the story. The book was just a fantastic ride and I’m vaguely familiar with Hinduism, so it was just lovely. I already can’t wait for the next book in the series and to meet the rest of the sisters! What mythology do you want to have an ownvoices book for? I loved this book too!! I really need to get going on the other books under “Riordan Presents” this year! I have a couple checked out from the library now thanks to this one! I’m excited to read them. Have you heard of ‘Charlie Hernandez and the League of Shadows’? It’s not under Riordan but just came out and sounds like it’s fits right in! Have fun with The Storm Runner! I know ppl have really enjoyed it! Thanks! I’ll add the book you mentioned to my TBR, too! I love middle school books as well Haha though I have read barely any in a good while, will definitely need to check out some books under the Riordan presents! I recommend them so far! This was a very fun read, and I think that all the ones in his imprint will be good.